Saturday, November 14 1908 -- The highly anticipated annual football game between arch-rivals Stanford and U.C. Berkeley is today, a tradition that began in 1898, and I gather still entails a lot of hoopla today. The distinguishing difference between an employer and an employee is that the former is not expected to keep his personal output up to the maximum when he grows old. 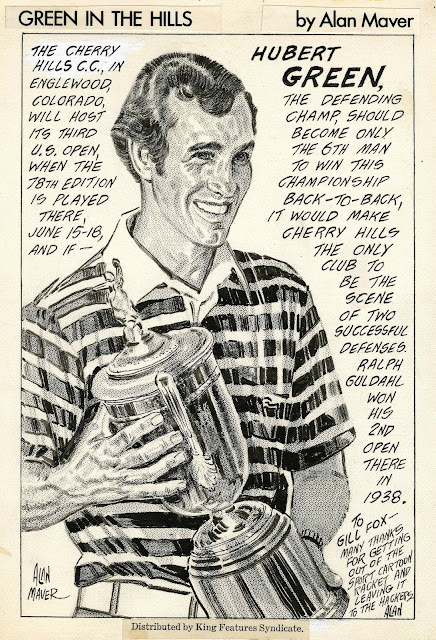 As years increase, the employer relaxes more and more, taking up golf as his arteries harden and devoting most of his efforts to seeing that his blood pressure is normal, but the hired man must continue to produce in standard quantity or take the gate. The insatiable greed of proprietors and managers to extract to the last drop the divine essence of talent or genius every day blinds them to the fact that speeding up honest-to-God genius always results in a lessened output, but few there be who can resist the ignoble urge to squeeze out another column, another picture, another poem from the willing worker. Sometimes even a suspicion that an employee is weakening will cause an employer to undervalue him. A curious jealousy is at times discernible in certain proprietors when a worker makes a marked success; I have often noted an eagerness to prevent or check anticipated conceit or self-appreciation in such, all of which, of course, is merely the evidence of an instinctive fear of having to increase the stipend. All employers love the humble toiler who imagines his job is the only one on earth, just as they dread and suspect him who sits lightly on the perch, knowing that his wings will carry him anywhere. For a time, ten or twelve years or so, Pulitzer was never troubled by such fears. Hearst, I think, was never embarrassed by them at all, but Bennett, Wanamaker and Munsey were always deeply concerned lest some of their people should get the swelled head. When the "Rambillicus Book" appeared, the department stores of Philadelphia and Chicago made counter displays of it, but Wanamaker ordered his book department to keep them out of sight for fear that I might become too prosperous. I have known men who would spend hours devising methods of keeping too efficient aids from contracting the notion that they ought to be partners. This desire to squeeze out profits, or at least to even up expenses, brought most of the big papers into the syndicate business. Among the most successful, for a period, was the North American. I did one series entitled "Fatty Felix" for four or five years that was sold to papers from the Atlantic to the Pacific until it grew too heavy a burden for me, owing to the fact that I had unwisely adopted a scheme that called for five or six characters in each picture instead of two or three, as the modern stripper does. Rudolph Dirks in his "Katzenjammer Kids" made the same error, but not being obliged to do any other work, he has been enabled to carry the weekly burden triumphantly for some twenty-eight years with an unimpaired intellect and astonishing variety. As time went on, other means were found of decreasing the overhead. I was invited to enter the syndicate myself. 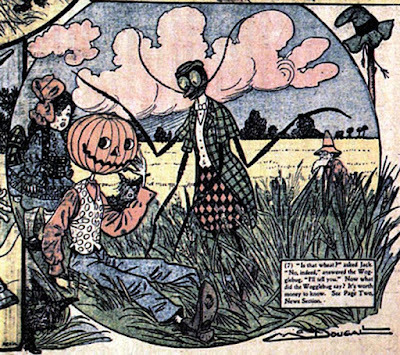 A deal was made between the N.A., Riley and Britton, Frank Baum and myself to produce a "Wizard of Oz" page weekly, Baum stipulating to furnish ideas, but he almost totally failed to produce, having no pictorial talent. In this page first appeared the Scarecrow and Tin Woodman. Instead of salary I received a percentage which reached a little over a thousand dollars per month, but when the inevitable business disputes began I went back to my original arrangement. 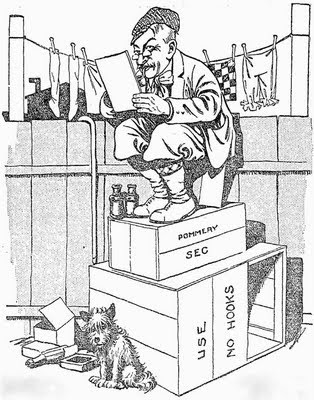 Then came one Joseph B. Bowles, from Chicago, who had syndicated Bryan's trip around the world. He proposed to put "Peck's Bad Boy" into the colored comic pages. An arrangement was entered into with him on similar terms. I at once found it quite impossible to use Peck's Boy, mainly because he was not of the type suitable for this sort of page, as well as because Gov. Peck's humor was not pictorial, but I made the page in my own way, creating a new type of healthy-minded boy instead of Peck's degenerate literary offspring, and it was one of this series that brought Jackie Coogan into the "movies." Bowles was a small, nervous half-portion of a man and deeply religious. I was in consequence somewhat suspicious of him, but I reflected that if Ed Van Valkenburg had not shied at him I need not. The N.A. had more at stake than I had. Bowles came to my house as I was giving a little dinner to some of Atlantic City's political pillars. He arrived in a big crimson (hired) car, an imposing entrance, as automobiles were still rare and impressive, and I invited him to join us. Quite suddenly, in a pause of the table talk, Bowles said to that bunch of hard-boiled operators, in a high shrill voice: "I do not see how you gentlemen can go through your daily lives without the help of the Lord Jesus Christ!" A gas bomb exploding on the table would have created no greater sensation, but in another moment the gang concluded that the mean-looking little man must be an entertainer, and all burst into hearty laughter at a unique form of Chicago humor. This "Peck's Bad Boy" series ran for over a year, and I then abandoned it. There came to us Charles Nelan, one of those accidental products which confound all theories and perplex the philosophers. 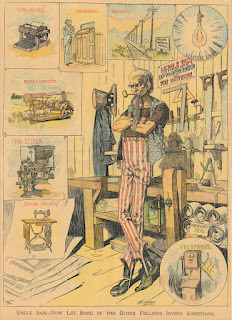 A grocery clerk in Ohio, he gained a small prize offered for a cartoon by a local newspaper, and in course of time actually attained to the position of cartoonist on the New York Herald. 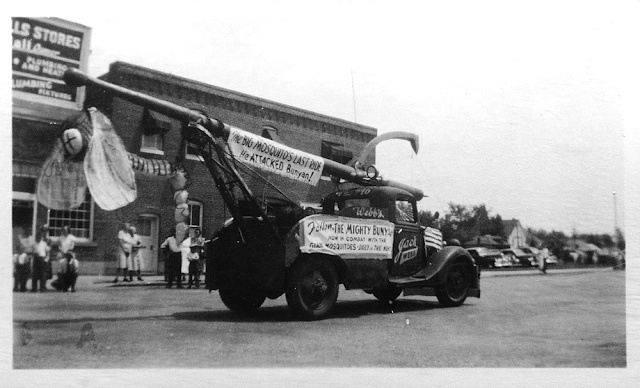 He was a big, stolid fellow, but with a knack of making the conventional cartoon, such as Uncle Sam weighing the annual grain crop or Father Knickerbocker hoisting the flag on City Hall. He was receiving $150 weekly, when Reick one day told him that unless he got out with the boys, saw some real life, and got a wiggle on, he would fire him. Charley consulted his friends, who advised him to throw a scare into Billy by a threat of resigning, but to his horror the resignation was accepted. He took a position with the North American at $65 a week, forty-five of which he probably saved, and died, with a goodly fortune in the bank, of tuberculosis some ten years later. For a time he worked in my sumptuous office, but the Turkish rugs and imported water colors oppressed him, and finally Wanamaker placed him in a less gorgeous workroom. T. B. used to send me every week all the Paris papers, usually translating many of the jokes in a small, neat handwriting. One day Nelan carted these to his home, and when I asked for an explanation of the unusual proceeding, for he knew not a word of French, he replied with much heat: "I want you to understand I'm as much of a humorist as you are!" "Well, all I've got to say is that if a man has a good home and a good wife he oughter be happy." "Ham" Marshall was another character who gave distinction to the staff. Ham was one of the few remaining Bohemians of the old times. Carelessly dressed, even seedy at times, he was a gifted and erudite man. Always with a volume of Italian poetry in his pocket, homely to painfulness, yet fascinating to women, he made a sort of specialty of testing each boarding house in a street until he had occupied them all, thereby acquiring an immense acquaintanceship. Once with a friend in New York, I met him along about midnight and he invited us up to the room which he was occupying with a man whose name I have forgotten. There he soon produced a faro-bank outfit, and in a few minutes we were busy gambling. When in the small hours my friend and I were cleaned out and prepared for departure, Ham accompanied us downstairs. At the door, with every evidence of deep gratitude, he shook hands and said: "My God, Walt, I am mighty glad you dropped in! We were worrying over how we were going to pay our rent today, but now everything is all right." When he had a difference with Van Valkenburg and resigned, he almost threw the boss into a state of coma by producing a bank book with some thousands to his credit. I bought a house in Pleasantville, N.J., a suburb of Atlantic City, in 1907, devoting a portion of my time to pheasants and Plymouth Rock Chickens. Within two years I was an authority in the poultry journals and a judge at the chicken shows! Merit is always recognized. My farm was on the water's edge, and upon it was an ancient "kitchen midden" or prehistoric shell heap replete with neolithic stone implements; the hotels of the summer resort were amethyst against the horizon four miles distant across Absecon Bay. When I sold this place to a Salt Lake man, there were 2,300 chickens, 700 pheasants, 86 turkeys, uncounted guinea hens, 75 mallard ducks, eleven Llewellyn setters, one cat, one horse and one cow on the six-acre demesne which had been christened "Windy Top." 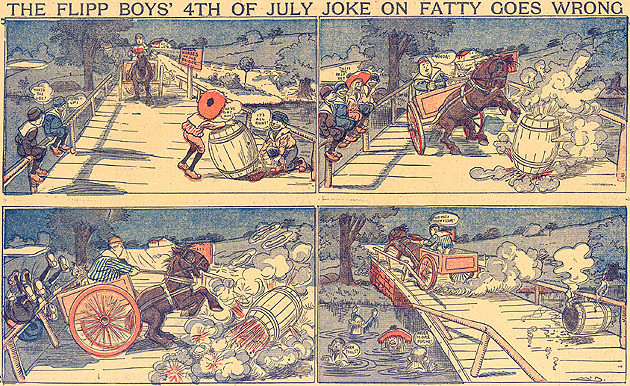 The necessity of keeping up with the schedule of syndicated comic stuff largely inhibited going to conventions, flooded districts, country fairs and baseball games as of yore; the daily cartoon usually went up to Philadelphia by the train conductors, and I led the life of a portly English squire. I received a hundred pair of quail from the State Game Commission and broadcasted them on my estate, where they throve to the benefit of gunners next autumn. The differences between the city administration and the virile North American had grown so pronounced as to be almost savage. The Mayor, Reyburn, a somewhat eccentric and anomalous individual, by his marked peculiarities gave Van and his editors many opportunities for sharp and bitter comment; his habit of prowling about at night and attending banquets where he spoke in language so incoherent and wild as to create the belief that he was intoxicated, afforded me the chance for a series entitled "The Reyburn Nights Entertainment," which I, at least, enjoyed exceedingly. Van Valkenburg was arrested, charged with libel, about every fortnight. About once a month I was caught in the net, but we were invariably victorious and went right back and did worse things to them. When Van and Arthur McEwen really tried to be scurrilous and vitriolic, the output was simply sizzling, and if Mayor Reyburn was not crazy, as he accused us of hinting, it was only because he had a stronger mentality than anybody suspected, for we drove him almost frantic. Even if the paper won no political victories, it established a reputation for high moral aims, vehement rectitude, militant municipal purity and general uprightness never exceeded by any purely commercial-and-political outfit ever seen in Pennsylvania. When, however, in 1911 I think it was, they succeeded in winning one contest and elected Mayor Blankenburg, Van, like a mere politician, promptly installed his Brother Fred, in one of the fattest offices in the City Hall. One of the humorous things, and one that sheds a light upon human frailty, which has always inordinately interested me, happened about this time, when Sarah Bernhardt was making her last (guaranteed) farewell performance in America, at the period when the managerial hogs compelled her to appear in a circus tent. 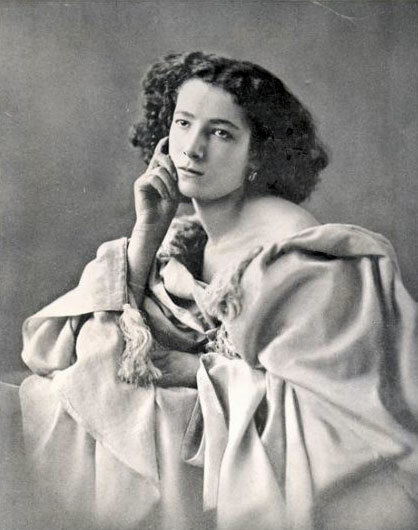 Her manager wrote to a friend of mine, a Chestnut Street confectioner of note, that the great tragedienne would exchange an autographed testimonial to the excellence of his wares for a specified sum. On his declining, the sum was materially reduced, the offer now coming from some far Western city, and just before Sarah sailed she came down to five pounds of chocolate f.o.b. the steamer at Jersey City! At the Buffalo Exposition, Julian Hawthorne and I were the first to take a ride in the Loop-the-Loop, that day completed and opened to the public; the next year, in a carriage driven out Market Street to test the first wireless apparatus ever devised; that same year, to ride at twenty-five miles an hour on the beach at Atlantic City, and a year later, with Cressy doing a mile in 37 seconds, which quite satisfied my greed for speed, never very pronounced; at the Jamestown exhibition I had my first ride in a dirigible, in 1907, a funny little object motored by a 12-horse-power Mianus marine engine but quite practicable and very enjoyable. 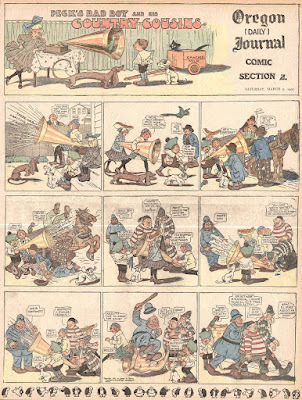 In 1908 I again appeared for a few weeks in vaudeville, doing my newspaper pictorial work, as did Winsor McCay, in the dressing room of the theater, in a talk entitled "The Mystery of the Female Shape," the assumption being that the feminine attire of certain periods implied a similar anatomical construction. The only notable thing about the proceeding was the revival of the old song "Silver Threads among the Gold," which I had dug up to accompany the picture portraying the female form of the '70's and which has continued to be popular. As part of my education in the Wilkes-Barre park* I had learned the word "graft," then signifying the particular form of chicanery practiced by the outdoor show men, fair-workers and the like, such as cane-racks, fishponds, wheels of fortune, and one momentous day in the N.A. office when we were discussing the need of a new and non-libelous word as a substitute for boodle, spoils, rake-off, etc., I suggested this perfectly good and little-used synonym. The suggestion was applauded and we started the campaign with a picture of a sort of hideous prehistoric animal similar to the Rambillicus. It was immediately adopted all over the country, caused our opponents unheard-of misery, and is now in the dictionary. This alone should make me famous; many a man is in "Who's Who" for far less, yet that inestimable publication, for no discernible reason at all, dropped me out in 1916 after harboring my record since it started business. However, as it rejects Jim Corbett, my fellow author, I have no right to complain. It was about this time that I wrote a story about double-yolked eggs that I meditated hatching into double-barreled hens but only procured two-headed roosters, and somebody copied it that afternoon and sold it to Von Hamm, editor of the N.Y. World, causing him extreme mortification and obliging him to apologize to the Philadelphia sheet that had these nifty up-to-date ideas. I have mentioned that my contract was for a five-day week, leaving my Saturdays and Sundays free for scientific pursuits, painting and other recreation, but out of pure good nature and an interest in the paper's welfare, I had continued to make a cartoon on Saturday for the city editor, James Benn, one of Van's political creatures. One day in 1908 I was called upon to preside over a banquet given by all the cartoonists of the land to Mark Twain at Delmonico's, which was a notable event, for which I left the data at the office for an inside story, which did not appear although all the other Philadelphia papers gave much space to the event. On Monday I was informed that Mr. Benn, who had about as much to do with my affairs as Archbishop Ryan, had ordered the cashier to deduct twenty-five dollars from my salary because I had failed to furnish the Saturday cartoon. I repaired to Van Valkenburg's room, where I found Mr. Barclay Warburton, the owner of the Telegraph, with Van, and I made a vigorous and pointed protest against the action of Benn. He began winking rapidly. I made him admit that the proposal of a five-day week was his own, and said that unless the palpable outrage was rectified I would consider myself discharged. Poor Van tried to sit upon two stools, much to Warburton's amusement, and the upshot was that I withdrew in a huff, followed by Warburton, who asked me to promise him that if I left I would come to the Telegraph. Van, of course, found it impossible, for unknown reasons, which may be guessed, to turn down Benn, and I did not return, but a week later he sent for me to ask me, pathetically, if I were going to put him in a hole with all these syndicate contracts for my work at stake. Yet he did not offer to soothe my offended dignity by a recognition of my rights. In disgust I told him that I would do a comic page every week for one hundred dollars until his contracts expired. This agreement I kept, but did not renew it, nor, I may mention, did many of the N.A. 's customers renew theirs. Herbert Johnson took up the daily cartooning most efficiently, and with Bradford's humorous daily strip to console their readers I suppose my departure was quite unnoted, but one delightfully satisfying reflection remains permanently with me: from that day the circulation of the North American began to drop until it became merely a third-class also-ran instead of the foremost paper in Pennsylvania, and recently, in his old age, Van Valkenburg forsook it, and it fell into the hands of Cyrus H. K. Curtis and ceased to be. * McDougall never names the amusement park which he operated. We know that it was in Wilkes-Barre, and that he referred to it as a "trolley park", which generally means that the park was situated on a (customer delivering) trolley line. The park that best fits that description is the Sans Souci Park, which was in business from about 1880 to 1970. Alan B. Maver was born in Manhattan, New York City, on July 5, 1909, according to the New York, New York, Birth Index at Ancestry.com. In the 1910 U.S. Federal Census, Maver lived with this Scottish-emigrant parents and four, older New York-born siblings in Manhattan at 727 Columbus Avenue. His father was a carpenter. The 1915 New York state census listed Maver and his family at 108 West 102nd Street in Manhattan. The address was the same in the 1920 and 1930 censuses. Information about Maver’s education and art training has not been found. 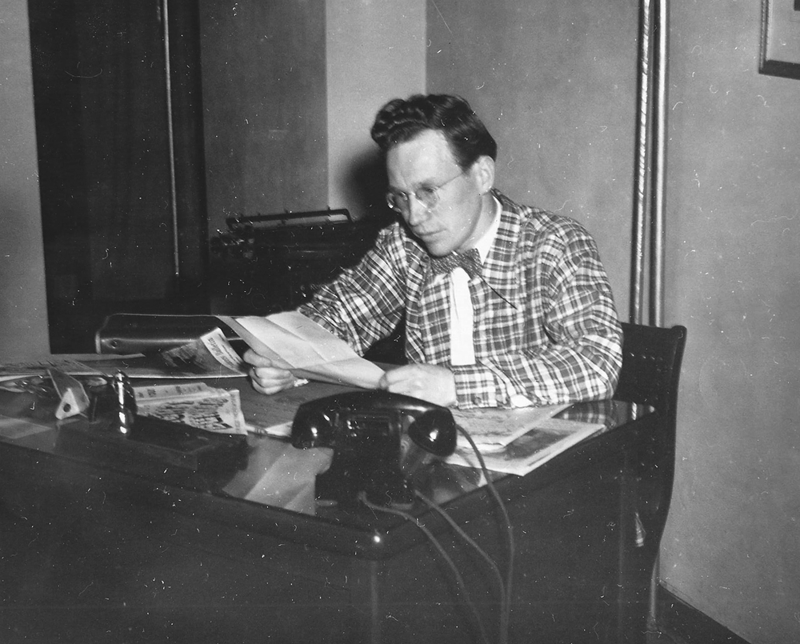 In 1930, the census said Maver was a newspaper reporter and cartoonist. The Town Times (Watertown, Connecticut), February 2, 1978, said, “Maver…began his career as an assistant to Feg Murray, whose work was appearing at the time in the New York Sun. 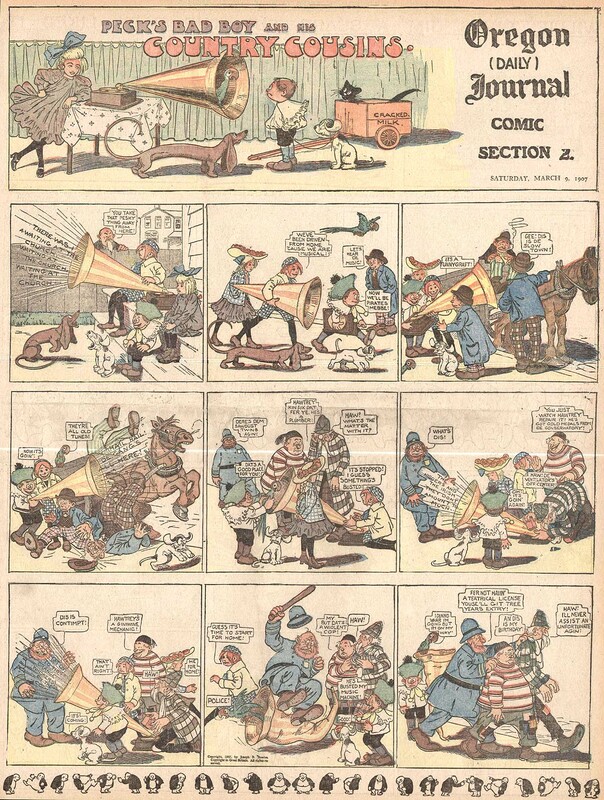 He took over the sports cartoon production six years later when Murray left the paper.” It appears Murray’s sports cartoons began in 1923 with Sports of 1923 from Associated Editors. Presumably, Maver assisted Murray beginning sometime in the mid- to late 1920s. Maver’s sports cartoons were distributed by United Features Syndicate followed by King Features Syndicate in 1948, according to The Day (New London, Connecticut), May 24, 1984. Some of his cartoons, from 1946 to 1967, are here. 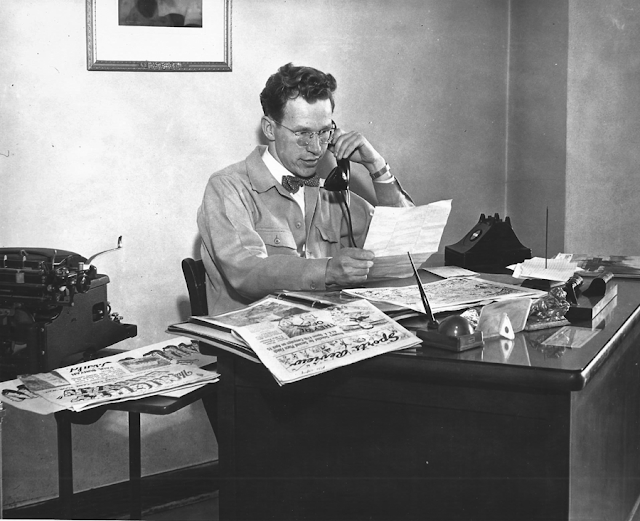 American Newspaper Comics said Maver drew the World War II series, Stars in Service, for the United States Treasury Department. Maver also had a brief career in the comic book industry. Some of that work is here. In the 1940 census, Maver lived with his parents and two siblings in the Bronx, New York, at 334 East 205 Street. Manhattan, New York city directories, from 1944 to 1948, listed Maver at 640 Fort Washington Avenue. Maver passed away May 22, 1984, in Southbury, according to the Connecticut death index. His death was reported two days later in The Day. During World War II our government issued a lot of patriotic material to newspapers, quite a bit of which was in cartoon form. From the U.S. Treasury Department came a number of features whose message was for newspaper readers to buy war bonds. One of those features was Stars in Service, a panel series highlighting famous people who were serving in the armed forces. The root message was that if these famous folks can put their lives on the line, surely you, Mister and Mrs. America, can at least buy some bonds to support the war effort. The series was drawn by veteran sports cartoonist Alan Maver, who drew for King Features for close to half a century. Naturally given Maver's specialty, the lion's share of the Stars in Service subjects ended up being sports figures. As with most features issued by the government, Stars in Service would have been issued in batches to newspapers. Editors were free to run them when and as often as they wished. They were great items to fill holes, and for smaller papers they were welcome free substitutes for the comic strips and panels they could barely afford. 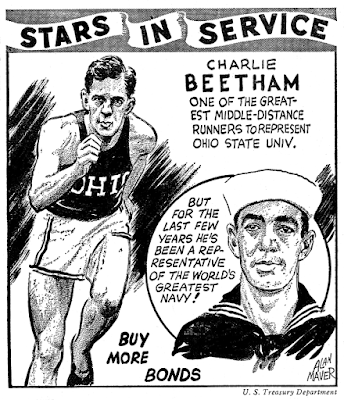 As best I can tell, the Stars in Service series was first issued to newspapers around April 1943. It's tough to determine just how many were issued, or if there were multiple batches issued over time, but I've not seen a tremendous number of different panels, so perhaps just 30 or so in all? 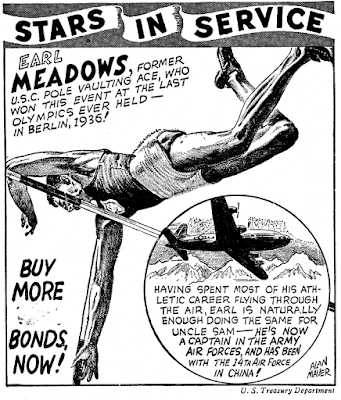 In reading Laura Hillenbrand's acclaimed book Unbroken, I noted on page 190 the "Stars in the Service" sports cartoon by Alan Maver's of track star Louis Zamperini, with caption, "This clipping was in Louie’s wallet throughout his raft journey, and was stained purple by the wallet dye. Its discovery by the Japanese resulted in Louie and Phil being beaten. I found these "Stars in the Service" panels in the Wilmington, Delaware, "The Sunday Morning Star" on Google News Archives starting around Mar 14 through Nov 28 1943. I would be glad to send them to you to add to your blog here. 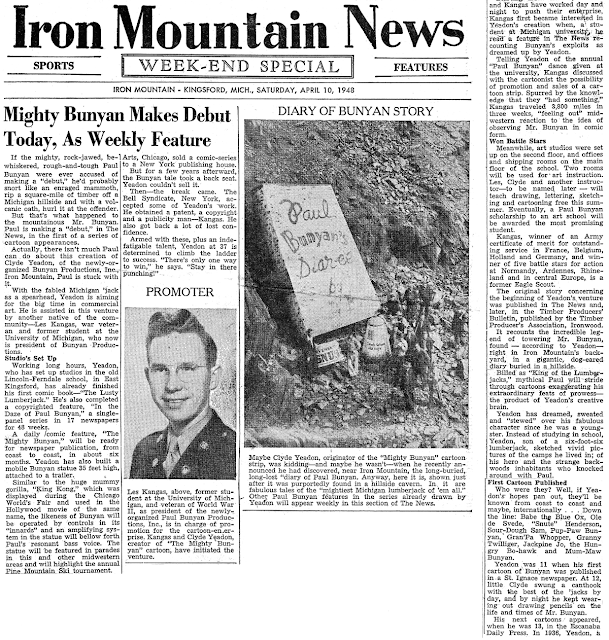 Please email if you want me to send...if not, thanks for remembering Alan Maver - I featured many of his sports panels to honor West Point football players at the Army Lore blog...under Army Greats Sports Cartoons..including two "Stars in the Service" panels of Ike Eisenhower (Prescott Evening Courier Nov 20, 1944 - note the late date) and Harvey Jablonsky (Sunday Morning Star, Nov 7, 1943). yep-again Bob Feller - The Sunday Morning Star, Jan 24, 1943 p. 13 of 17..ok thats enough if I find something earlier! A short while ago, I discussed The Mighty Bunyan as our Obscurity of the Day. I described Clyde Yeadon, the creator of the strip, as a one-man show. Well, turns out my assumption was dead wrong, and I was very politely corrected via email shortly thereafter. 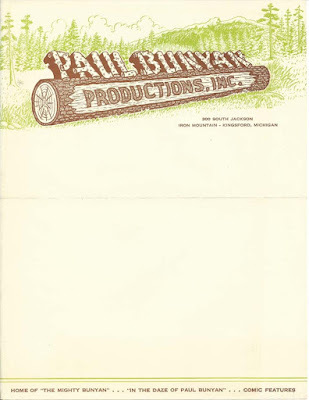 It turns out that Paul Bunyan Enterprises was very much a collaborative effort, and that Clyde Yeadon's partner in the venture was a fellow named Les Kangas. Kangas was obviously a marketing prodigy, and he went all out in service of Yeadon's concept. Bunyan 'formal' dance -- come dressed as a lumberjack. 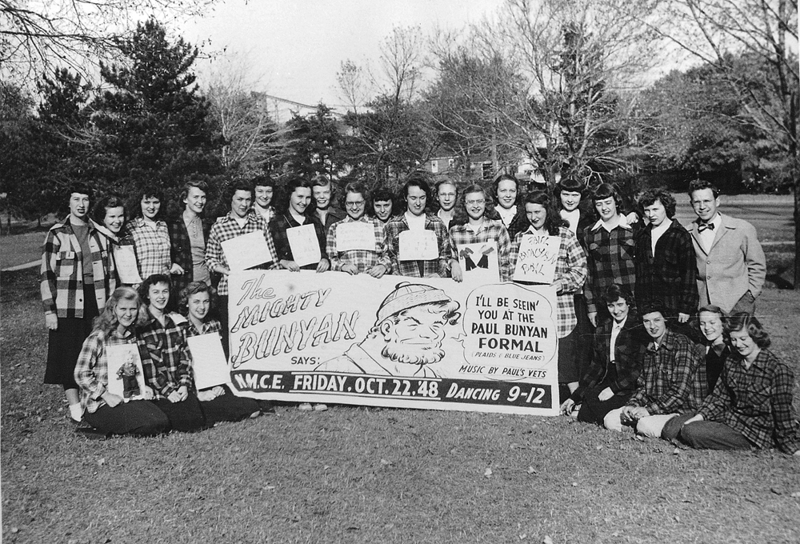 Note the Bunyan doll displayed at left front. News story, unfortunately missing a few lines that seem to have been clipped off. Note pic of giant 'diaree'. Thanks very much to Les Kangas Jr. for submitting these delightful and interesting pictures. 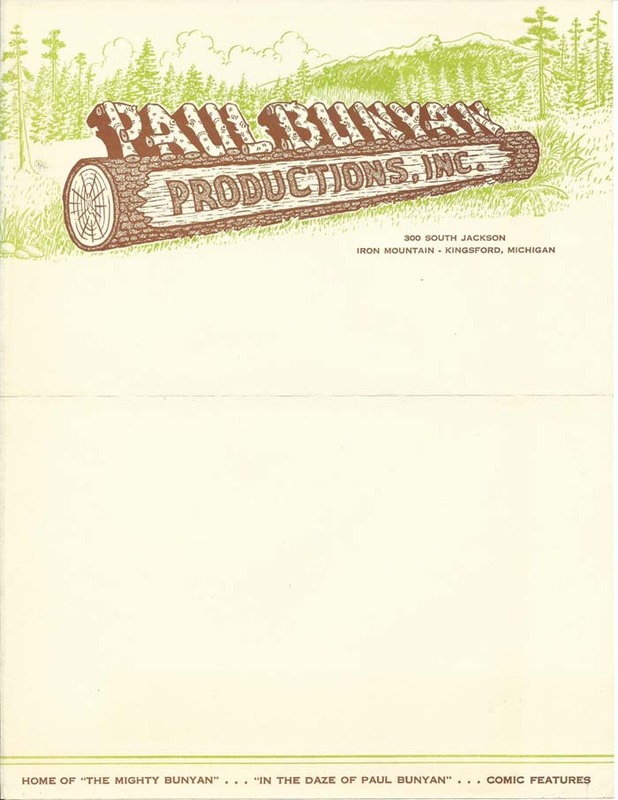 If the Mighty Bunyan didn't catch on, it sure wasn't from your Dad's lack of effort! 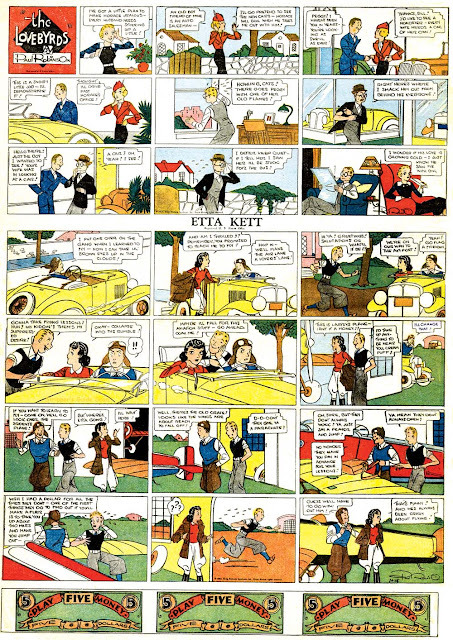 Paul Robinson's long-running teenage gal strip Etta Kett, which began in 1925, added a Sunday version in 1932. From the first installment of the new color strip on January 10, The Lovebyrds topper strip was riding astride it. I tend to think of young married couple Horace and Peggy of The Lovebyrds as a glimpse into the likely future of Etta Kett and her beau Wingey. Their hijinks betray the same stunted emotional status as teens, despite their more advanced years. Paul Robinson's lovely fine-line drawing style makes it easy to forgive the silly goings-on, and just enjoy the ride. Unfortunately that ride for The Lovebyrds ended in 1942 (June 28 as best I can determine), when Etta Kett was, formally or informally, demoted to King Features 'b-list'. From then on the Sunday Etta is seldom seen running anywhere, though it continued to be produced until 1974. Always wondered about what it must have been like to work on a legacy b-list strip at the end of its days.. putting in the effort, cashing the checks, and all the while knowing full well that your readership is nil. Reminds me of Barton Fink, getting paid to produce screenplays for films that will never be made.